I was just telling chioClara that I want to try out Hada Labo after finishing my SK-II miracle water because it's too expensive to buy another one. It's such an awesome timing that Fr3b contacted me. Thanks for sponsoring me these two products. 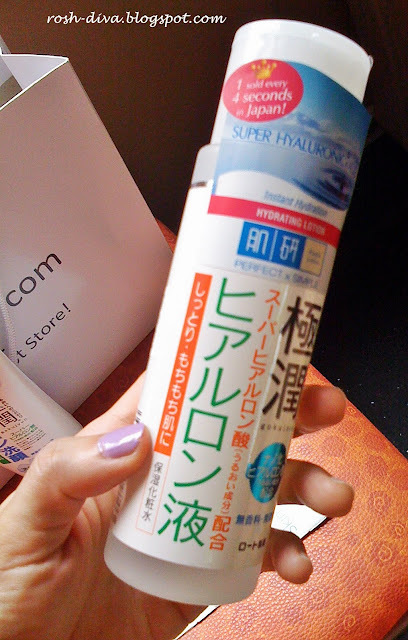 This week, I have used the Hada Labo face wash. It's mild and gentle to the skin. There is also no strong fragrance (which is good). Next, I poured 2 drops of the lotion on my palm and pat on my face and neck. The texture feels almost like an essence; somewhat in-between toner and serum, but not sticky. After the hydrating lotion, I skipped moisturizer. I applied my Lancome Blanc Expert Spot Eraser and then sunblock, followed by BB cream. I feel that there is no need for moisturizer. The Hada Labo lotion seemed to have a little dewy effect. It also made the BB cream easier to blend in. I have been using this for the 5th day already. My skin feels soft and smooth. I read that some people have bumps or outbreaks after using this. I think the trick is to alternate the usage because the AHA ingredient may be too rich for some. 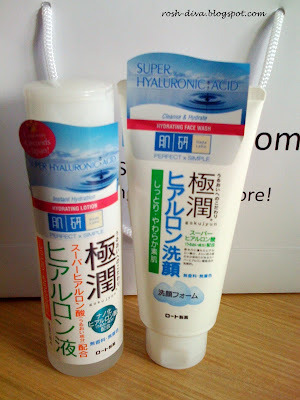 Hado Labo is made in Japan and is exclusively sold in Watsons. I heard that they will be launching a mist soon. Check it out. Hehe, I also couldn't believe that Paul, the octopus is really one octopus -_-. Sounds promising! I think I might try that. I'm alway buying new stuff from Watson's to try! And I've polled on beauty stuff! I tried the cleansing foam and it's great! It's really value for money :). Now, I want to try the hydrating lotion as my colleague has been raving about it! How is it so far? What skin type is it for? Was contemplating to get SK-II leh.. So far so good. I have been using the hydrating lotion every alternate day. No breakouts and bumps as what the podders and cotters claim. SK-II is good as well (hydrating purposes) but not as friendly to the pocket. The cleansing foam cleans well and doesn't leave a tight feeling on the face. So I think it's gentle enough to the skin. @ Jo - thanks babe for polling. Yup I also dig stuff from Watsons, esp when it's 'made in Japan'.